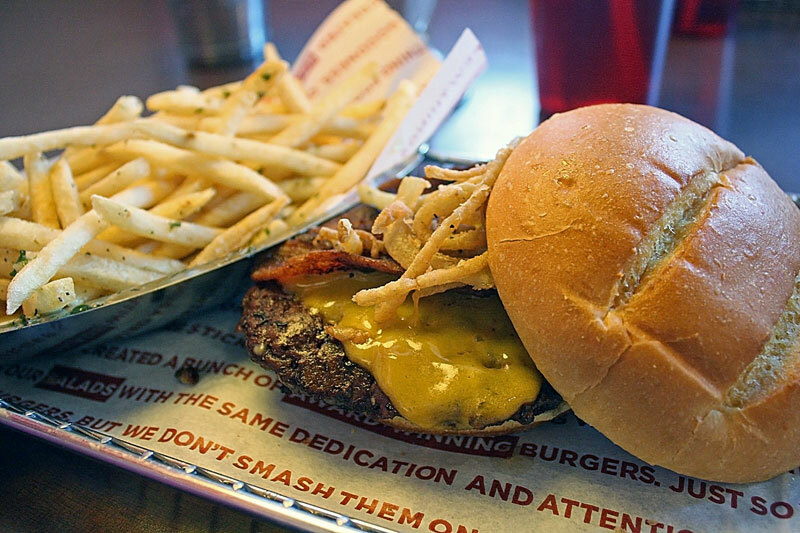 We're always on the look out for our next favorite burger place, and when we heard rave reviews about Smashburger's fries, we decided to give it a try. We immediately loved the atmosphere (and convenient location next to Yogurtland :) with it's giant text on the walls and visually appealing menu. I decided to go with the Beehive Burger and Owen started to do a make-your-own, but then we realized it was basically the same ingredients as the Baja Burger, so we went with that. I've been craving a plain chocolate milkshake for a while, so we got the malt, and then took our number and were seated. 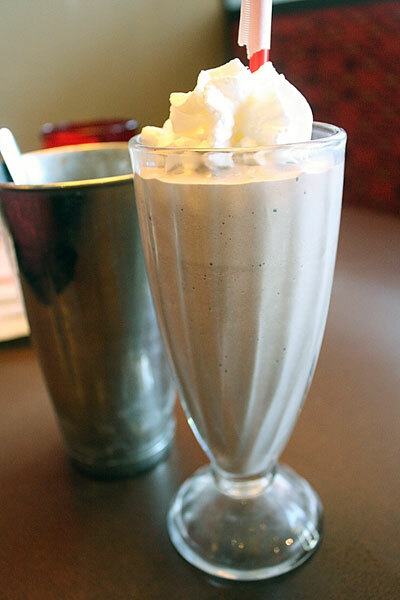 Our shake arrived first, which is always a dangerous thing. It was absolutely perfect - a little small, but at least they gave us some in that metal cup behind as well. We basically inhaled it, and fought over the final slurps. The service was very attentive - almost to a level of annoyance. It was pretty slow since we ate around 5, but we had three people come and ask us how our food was, which seemed a little bit of overkill for a couple of burgers. Also, one of the girls asked me if everything was "yummy," and for some reason that word drives me crazy, especially when we you are talking to anyone above the age of 5. Our burgers arrived and we were pretty excited thanks to the milkshake. Let's start with the fries. Their trademark "Smash Fries" are made with rosemary, olive oil, and garlic - three things I love. Which was why I was so surprised when I didn't think the fries themselves were all that great. They were the skinniest fries I've ever had, which isn't a personal favorite because I found them too crunchy and starchy. The rosemary flavor was nice but I hardly tasted any garlic, and just wasn't really blown away. My Beehive Burger was supposed to come with a honey barbecue sauce, applewood smoked bacon, cheddar cheese and haystack onions on an "artisan" egg bun. What is the deal with the term "artisan" these days? I swear everyone is just throwing around the word "artisan" to make things seem a little fancier and make them more expensive - it's one of those new buzzwords like "nano" and "synergize" and "network virtualization" (none of which apply to hamburgers of course...or do they?) Anyway, the artisan bun was actually my favorite part of the whole burger - the cheese was real, which is nice, but was pretty skimpy, I thought that they forgot the BBQ sauce until I was two-thirds done with the burger, and the haystack onions really were a disappointment. I was initially stoked about the idea of little individually fried onions, because I hate that moment when you are eating a burger with an onion ring on it and you take the wrong kind of bite and end up having to eat the whole onion that has slid out of the crunchy shell. This seemed to solve that problem. But unfortunately, it also totally detracted from the onion flavor, so it just tasted like little crunchy things on top of an average burger. Owen's burger was a little better - all of the flavors were there at least, and it certainly was spicy. But something about the overall burger was just lacking. 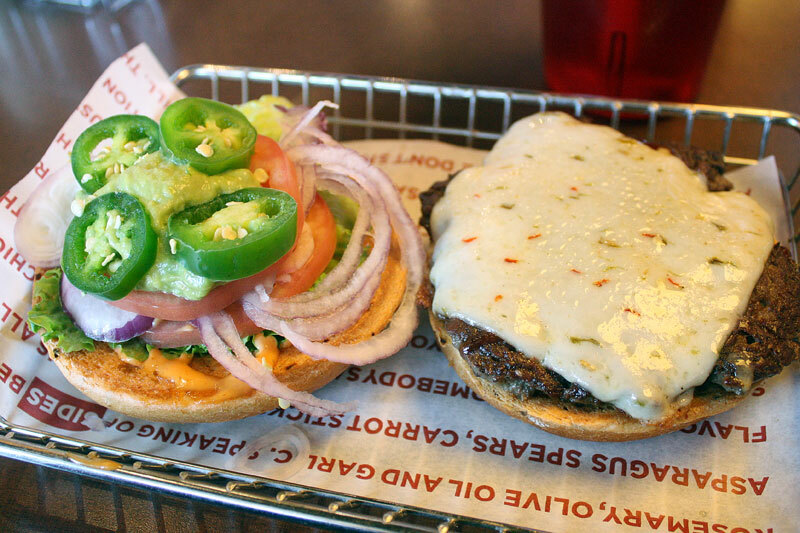 It didn't satiate the way a delicious burger should, you know what I mean? I think it might have been the actual burger - it wasn't very juicy, and by the end of the meal, we were still wanting more. We were full, but not satisfied. What You Should Do: If you are a serious burger lover and are looking for a new place to try, then maybe give this place a go (and get the chocolate malt). I think that if I ever went here again, I would probably test out one of their chicken sandwiches - their ideals about fresh and artisanal ingredients seem better suited for chicken than a greasy burger. But if you've got that kind of craving that only a juicy, meaty burger can satisfy, you'd be better off at JCW's.